When you plug the Big Ego into your USB port, it replaces the mediocre sound card in your computer, transforming your computer into a complete audiophile sound system. The built-in high-performance headphone amp makes your headphones sound their absolute best, and the line level outputs let you use your computer as an audiophile quality music source for your main stereo system. 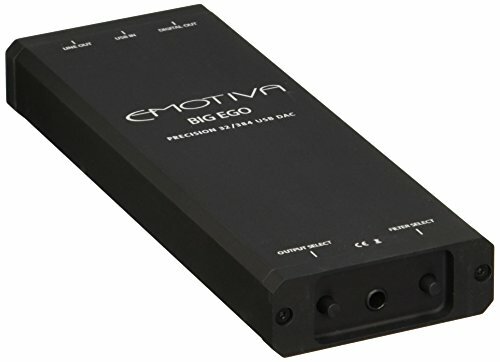 The Big Ego has all the performance features you'd expect to see in a big audiophile DAC, including an asynchronous USB input, a choice of three digital filters to fine tune the way it sounds, and a blend mode to make your headphones sound more like regular speakers. Advanced engineering, and precision components held to tight tolerances, enable the Big Ego to deliver impressive specs - like THD+N < 0.006%, a S/N > 106 dB, and a frequency response that's ruler flat from 10 Hz to 20 kHz. The Big Ego's rugged all-metal construction and tough black anodized finish will keep it looking good for years, and the easy to read LED indicators let you see at a glance what sample rate you're listening to. Of course, what really counts in an audiophile component is the way it sounds - and the Big Ego sounds superb. You owe it to yourself to hear just how good computer audio can be. Emotiva's Big Ego. Built-in high performance headphone amplifier and dedicated line output. Selectable digital filters and precision lossless volume control. Made in the USA - featuring rugged all-metal construction and a tough black anodized finish. View More In Semiconductor Products. If you have any questions about this product by Emotiva Audio, contact us by completing and submitting the form below. If you are looking for a specif part number, please include it with your message.